At Janel Online, we stock only the most premium names in the product assembly and electronics assembly industry. One such name, JBC Tools, is a top brand of soldering tools that we carry at Janel. 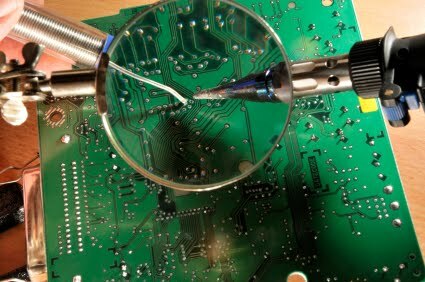 Whether for new soldering or reworking of electronic equipment, JBC tools are available to meet every need. Since 1929, for more than 80 years, JBC has been ahead of the game in developing soldering tools for use by electronics professionals. In the modern era, when lead is less environmentally acceptable as a component of soldering alloys, JBC tools deliver high performance and the temperatures needed. While other soldering irons require anywhere from 10 to 90 seconds to reach the recommended 360°C, JBC stations require only two seconds, cutting down your assembly time and making the soldering process even more efficient. The recovery time after each use is also superior - other soldering irons continually drop in temperature with incomplete recovery between joints, but JBC soldering systems lose less heat per use and completely recover between uses. This premium soldering technology delivers cutting-edge solutions in a professional world with high expectations. JBC soldering irons are backed by more than four generations of technology and testing, that other brands just don’t have. These soldering irons use a single wire as both thermocouple and heating element, controlled by a microprocessor. Other brands with twenty-year-old technology simply cannot compete. Tip life is extended and energy is conserved due to the control exacted through the microprocessor. Recalibration is not required between uses. When the processor senses that the iron is not in use, it reduces the temperature in the soldering tip. The quick recovery time ensures that you will not need to impatiently wait for the soldering tip to reheat. In addition, the irons are small and ergonomic. They are designed with the shortest tip to hand distance for superior control. On top of that, with the huge selection of JBC handpieces and solder tips, you can achieve a variety of small or large scale assembly goals easily. Many of our stations come with quick change capabilities, so you can change a tip hands-free achieving safety and efficiency goals. The entire line of JBC Tools comply with European Commission regulations and all recommendations for controlling electro-static discharge. Government contractors, original equipment manufacturers and repairmen alike depend on the quality of JBC soldering stations you can find online at Janel Inc.
An authorized distributor of JBC Tools, Janel, Inc. was incorporated in New Jersey in 1963 to provide soldering solutions. Several companies came under its umbrella, including JBC tools. Janel now distributes over 140 manufacturer brands to customers around the world.